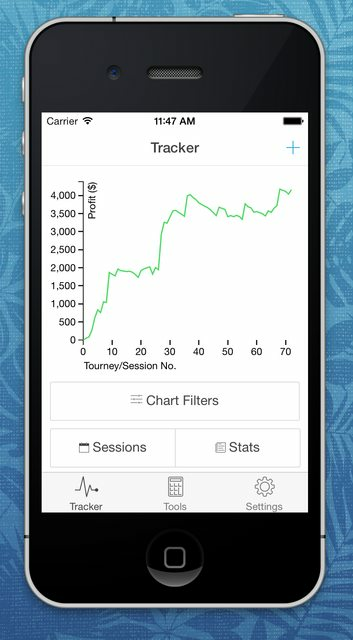 A few months back, I wrote about planning on building a poker app for live tournament poker players. I started playing poker a lot in the summer, nearly every day after work (sprinting on the Marketplace Feed). I stopped writing about poker since I settled into a grind. For those months, I was in the top three at my local poker club for tournament points. 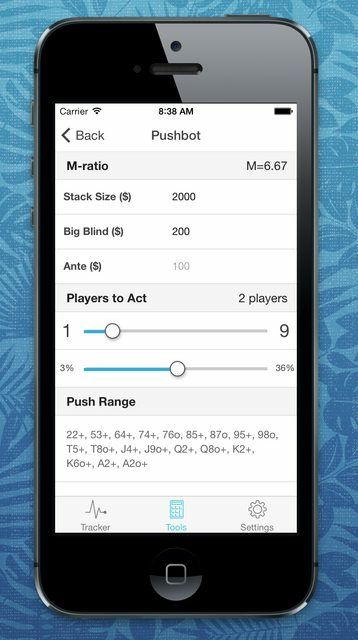 I spent the time after work and tournaments to build out my poker app. As a web developer with an iPhone, I wanted to build my app with HTML5 but be able to dogfeed it. 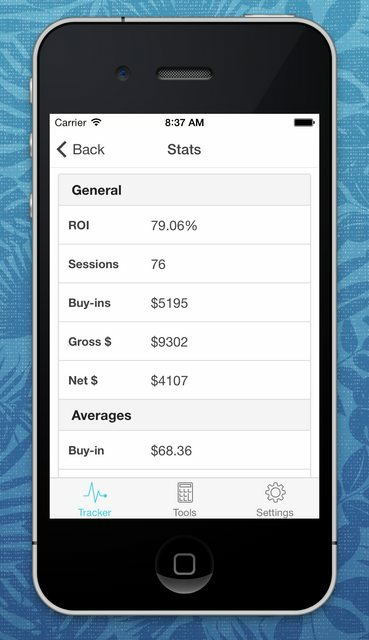 So I built the app as a hybrid mobile app using Ionic Framework. Using this, I then went to London to facilitate a session on building hybrid mobile apps at Mozilla Festival 2014. Afterwards though, I focused heavily on work and not doing much else. I broke the spell today, however, and went out to play a tournament after nearly a month in hiatus. placing first in a $1K guarantee tournament for $255. 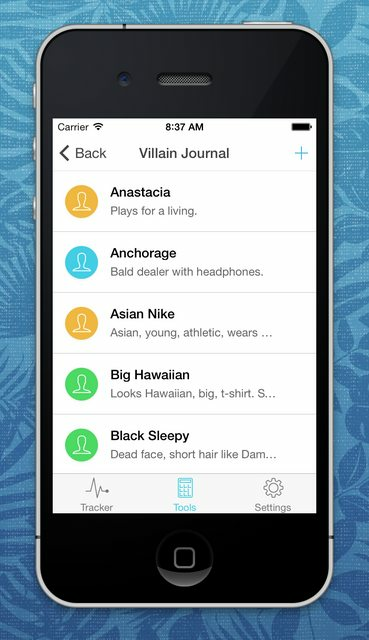 Villian journal to keep notes on opponent tendencies. Statistics page to view drilled-down numbers. Pushbot to calculate push/fold ranges. I hadn’t slept. Running on a non-24-hour sleep cycle, where my sleep schedule shifts forward two hours every day, I had just finished working from 8pm to 9am. I live in sort of an isolated time chamber with no obligations to the clock. At home, I don’t find much else to do besides work. With my girlfriend in another state, I balance free time between photography, poker, and a little bit of the piano. Anyways, I was on total auto-pilot, sort of in a carefree daze. But it was enough to take it home. I played patiently at the start, and aggressive small-ball towards the end. The final four was tougher than usual. One of the players on my right I knew was pretty smart, but he had been giving me a ton of respect the whole game, mentioning he doesn’t know why he keeps folding to me. Though by now, I think against him, I seem like a loose caller in all-in situations. The player on my left I was involved in a lot of blind vs. blind situations, we got into a bit of a verbal metagame. Though he got me back when I min-raised his BB, and we went to the flop. He checked dark and said bring me a Jack!. Well, that threw me off when I Jack came, I didn’t cbet my pocket pair and just checked. He bet the turn and I folded. And he showed Q-high. There was a hand in the BvB where I limp, to mix it up, from the SB with Q9. He calls. The flop comes Q6x. I bet, he raises, I call. I hit two-pair on the turn and we check through. The river comes another 6, putting a flush on the board. I thought a 6 was likely in his range, and I wanted to keep his bluffing range in play. So I checked. He became suspicious, “I can’t believe you didn’t bet that…”. He checks back and shows trips. I remark, “well, I can’t believe you didn’t bet THAT!”. The player to my right tells both of us, “I can’t believe neither of you bet!”. I saved some chips that hand. Once we got to the push/fold stage. We elected to flatten the structure, giving everyone $220 even and play winner-take-all for the remaining $90. With four players, it became a silly structure at 220/220/220/310, so we just chopped after a few hands. The floor director jokingly scoffed, “after all that work I didn’t to change the structure…”, as he was paying us out. It’s nice to shake off the rust with a win. After hiatuses like these, after the first tournament, I start to pick up and come back in full force. My many hobbies become active one-at-a-time in phases, and baby, it’s poker season. Next week will be the Mozilla all-hands in Portland, where everyone flies to Portland to hang out all week. Planning on playing with some coworkers at the Encore. Good times.